Usually when people think of Ice Cream they are probably thinking of Vanilla or Chocolate, but I wanted to go all out on this Ice Cream recipe and make something a little more special. 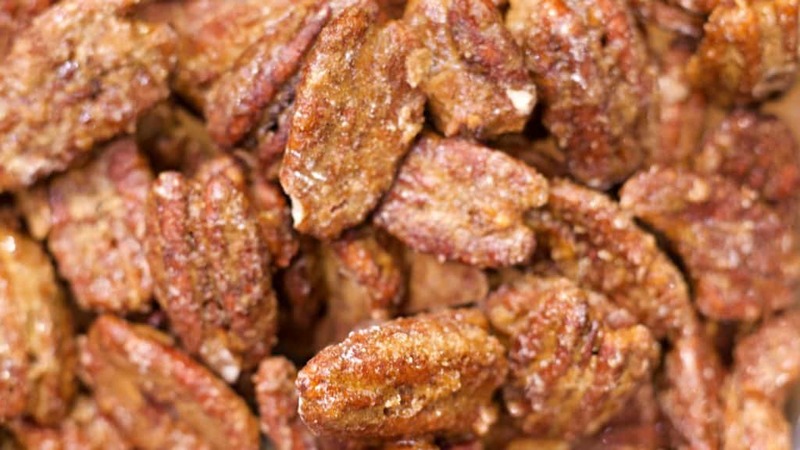 As an added bonus, you also get to make up a big batch of Candied Pecans that will make a great low-carb snack throughout the week as well as putting some of the extras on top of the ice cream if you want to also. 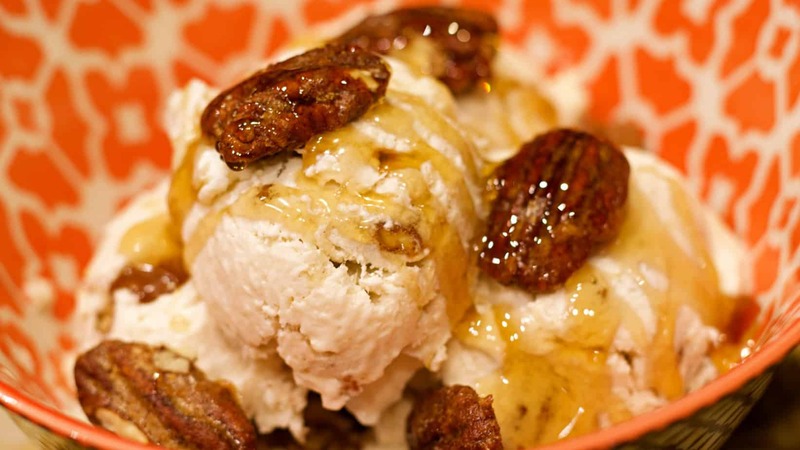 Butter Pecan is one of my favorite flavors of ice cream, so I created something close here with the Maple Pecan Ice Cream recipe. As an added bonus, if you have about 2 more carbs to spare you can drizzle the ice cream in your bowl with a little bit of the ChocZero Maple Pecan Syrup (but don’t put it in the frozen ice cream or it will freeze hard as a rock). This might look like it is a complicated dish, and I would classify it as a moderate dish but still not too complicated as say my Fried Rice recipe. Plus you have a dessert that you can keep in the freezer for up to a couple weeks if you want to treat yourself over a period of time. So it’s not like you have to make this all that often. The Recipe yields about a quart or so of Ice Cream, and it is very filling and packed with fat. Think of it as your frozen ice cream fat bomb! Preheat the Oven to 250*F.
In a Large Mixing Bowl whisk Egg White and Water together. In a small bowl combine Lakanto Golden Monkfruit Sweetener, Cinnamon, and 1 Teaspoon Salt. Pour Pecans into the large mixing bowl, and stir to coat evenly with the egg mixture. Gradually sprinkle the Sugar Mixture into the Pecans while stirring. Ensure even distribution. On a Large Baking Sheet covered with Parchment Paper (You will thank me later when you don’t have to scrape caramelized pecans off your baking sheet) pour the pecan mixture out and spread out as evenly as you can into a single layer. Bake Pecans @ 250*F for about 1 Hour, and when done set on the counter to cool. While the Pecans are baking combine Coconut Cream, Powdered Monkfruit Sweetener, 2 Teaspoons Vanilla Extract, and 2 Teaspoons Maple Flavoring in a Large Saucepan and warm over high heat until all contents are dissolved. Whip the mixture either by hand, or with a hand mixer using a whisk attachment. You will want to whip in some air bubbles to build up some volume. One you have the mixture whisked up, add in the Xantan Gum and continue to Whisk again until the texture is nice and thickened a little. Transfer contents to an adequate container to store in the Refrigerator for the next 30-45 minutes to allow to firm up while the Pecans finish cooking. It will chill to a pudding-like texture so don’t worry. Once the Pecans finish cooking take a Chilled Large Mixing Bowl and pour in 1 Cup Heavy Whipping Cream and Whisk with hand Mixer until peaks form. Add in 1 Teaspoon Vanilla Extract and 1 Teaspoon Maple Flavoring and continue Whisking for a minute or so. Using a spatula, add the chilled mixture we previously stored in the refrigerator, and fold to incorporate. Whisk this mixture together for a couple minutes using the hand mixer to create an even mixture, at first it may seem odd or lumpy but keep whisking it. Add in the desired amount of Pecans (I generally put about 1/4 in the Ice Cream and reserve the rest for toppings and for snacks later they are darn good by themselves), and fold the mixture together with spatula carefully. Transfer to a suitable container for freezing, cover, and freeze for at least 6 hours or so. Generally overnight freezing is preferred. When ready to serve remove from freezer 5-10 minutes ahead of time to allow to soften, this is a high fat ice cream so it will freeze a little harder than typical ice cream. Top with some of the remaining Pecans if you desire (1 more net Carb per serving), and sometimes I even top it with ChocZero Maple Pecan Syrup too for a lot more fiber and 2 more Net Carbs if you can spare them! This looks great! Any reason I can’t use my ice cream maker? None that I can think of. It should churn in there. I just wanted to demonstrate a method that most people could make at home without extra equipment. Do you put the entire pound of pec ants in the ice cream? How long does it need to churn in the ice cream maker? I do not put the entire pound of pecans in the Ice Cream. I save a lot of those to add on top later, or to eat as a snack too. I haven’t made this in an Ice Cream maker myself, so I do not know the timing for churning in one of those. Looks good. I live in Albuquerque NM. Where do I get some of these ingredients such as xantan gum and powdered monkfruit? I buy the powdered monkfruit at a Sprouts grocery store, and I buy the Xanthan Gum at Frys/Kroger. Bobs Red Mill is the brand that makes the Xanthan Gum I buy. Lakanto is the brand name for the Monkfruit Sweetener I personally use. These items can also be found on Amazon. I have had trouble finding some things locally. Good luck! I link to most of the “hard to find” items in the Ingredients List too, that way you can pop over to Amazon and either check out the product there if you’re not familiar with, and/or buy it if you need it. Does this taste like coconut ice cream or more vanilla? It tastes like Maple ice cream since the Maple flavoring is strong in this one. But you could substitute the flavors for other’s if you want. If you want to make this into Vanilla flavored, in addition to replacing the Maple with more Vanilla Extract I would also recommend scraping some Vanilla Bean into this. Otherwise the Coconut Cream doesn’t really make this taste like coconut ice cream, it’s rather mild flavored on its own I think. You receipes are by far my absolute favorite. I’ve made so many and have not been disappointment. Keep them coming!!!! What can be used instead of the whipping cream to make it dairy free? What is the monk fruit sweetener equivalent to in sugar? I’d prefer to use either Sucralose or erythritol so I need to know the equivalent amount of sweetness. More Coconut Cream but I would put that one in the fridge to firm it up so that you could whip it better. It will come out kind of like softened butter texture that way instead of liquid. The Powdered Monkfruit Sweetener that I call for in the recipe is double the sweetness for the same volume of Sugar so they are 2:1. BTW, the Monkfruit Sweetener that I use is mostly Erythritol anyways 🙂 it just happens that the powdered version is sweeter by volume. Maltodextrin has a Glycemic Index WAY HIGHER than sugar, so definitely stay away. Can I use arrowroot powder instead of Xanthan Gum? I hage looked over 5 times and perhaps I continue to overlook but you state to divide the salt … where do we use 1 tsp in #3, where do we use the other tsp?? Am I missing something? where does the other 1 tsp of salt go? i notice 1 going into the pecans……. If I can’t get the powdered monkfruit but I have regular (I’m in Canada so it’s really hard to get this) Can I use the regular, and if so should I add more? Can you use other sweeteners (i.e. Swerve) in place of the Monkfruit? Is Golden Monkfruit similar to brown sugar/substitute?